Hey y’all! This is one of our most commonly asked questions this time of year! So we decided to dedicate an entire blog post to this question and take some time to really expand the answer. First off, there is no wrong way to use this journal. Truly. We designed it with so much intention and it is created to meet you wherever you are in your faith life. It is a resource to help you grow closer to Christ and enter more deeply into the Mass. While it’s so fun to see people get creative with their journals it should never make you feel inadequate or wonder if you are doing it “right”. 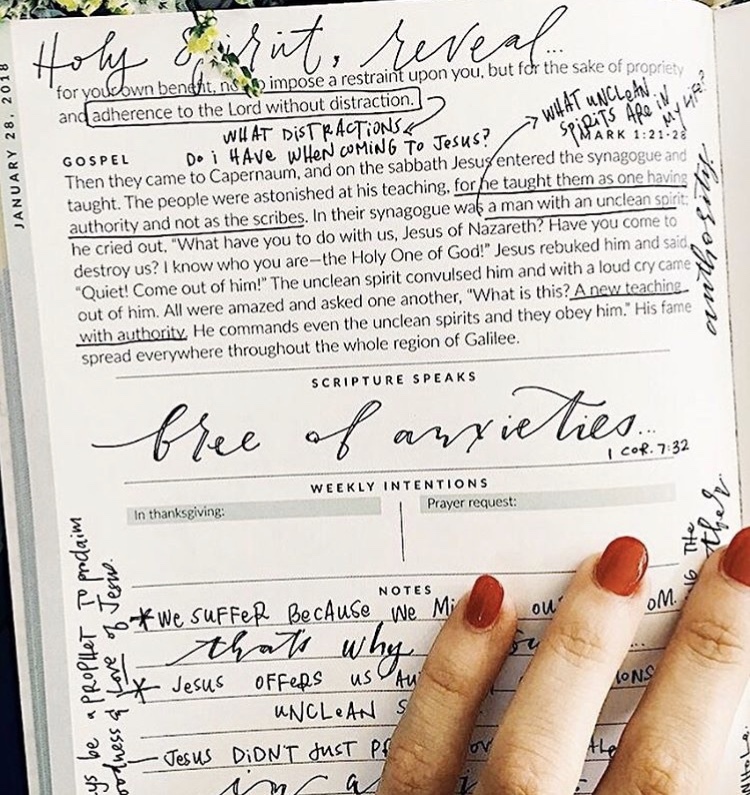 By surrendering our expectations we allow ourselves to more freely enter into this spiritual practice of journaling and engaging with scripture. When we record our thoughts on paper, it gives us a moment to pause and contemplate our lives. As we slow down, there is an opportunity for our spirits to settle and to hear the Lord’s gentle voice speaking to us. He speaks in silence, and by cultivating a habit of prayer and stillness we can invite God into our hearts. Imagine slowly pouring a pitcher of water into an empty bowl. At first, the water is agitated and splashes around in the bowl. But after time, the water slowly settles down and is still. A similar interior process happens when we break away from our busy lives and enter into conversation with God. We might initially experience restlessness, or even frustration, but as we build this habit we will see the fruit of investing time into our spiritual lives and the subsequent grace that will spill over into our everyday lives. “This beautiful book has been written to change your heart. Using it will help you train yourself to prepare to receive God’s Word, actively listen and receive His Word, and remember what the Lord has spoken to you. A simple approach is to think of using the journal before, during, or after Mass. The journaling template is designed to help you do this and we will explore each of these in more detail below. After spending some time with the readings, copy down a verse or two that you underlined or stood out to you. You can do the readings during the previous week and have this section filled out before you get into Mass. We also know some people who make an effort to get to Mass 10 minutes early and do it then. You can come back to this scripture verse during the week and remind yourself why it stuck out to you in the first place and further meditate on it using the lectio divina method. Write down any prayers of thanksgiving and prayer requests you may hold in your heart. These can be used to focus your prayers during Mass. As you move through the year, you may start to notice that your prayer requests start to become your prayers of thanksgiving as God answers those prayers. By writing these things down, we provide an opportunity for reflection on our spiritual growth and we can see how God is moving in our lives. This is a space where you can record a lot of different ideas! Is there something that stuck out to you during the readings and you want to write down that idea? Maybe there’s an opportunity to pray further with that piece of scripture. During the homily you can take notes on points worth remembering from your priest. After reviewing our customer surveys last year, we decided to expand our note-taking section since many people expressed they would like more room to write things down! How can you carry the Mass with you during the week? Did the priest offer any type of challenge or idea that you can implement in your daily life? Have you been meaning to get to Confession lately? Try to think ahead for the upcoming week and write down one action item as you go forth. How beautiful that our Church does not follow the rhythm of the calendar year! So many Catholics forget that our “new year” actually starts with Advent! As you consider the year ahead, think about how you may use this journal throughout the week and prepare your heart for Mass. Try writing out your plans so you can come back and check in on your progress! At the beginning of each liturgical season there is a short reflection along with some meditation questions. You can use the lines below to record your thoughts or any prayers you may have for that season. 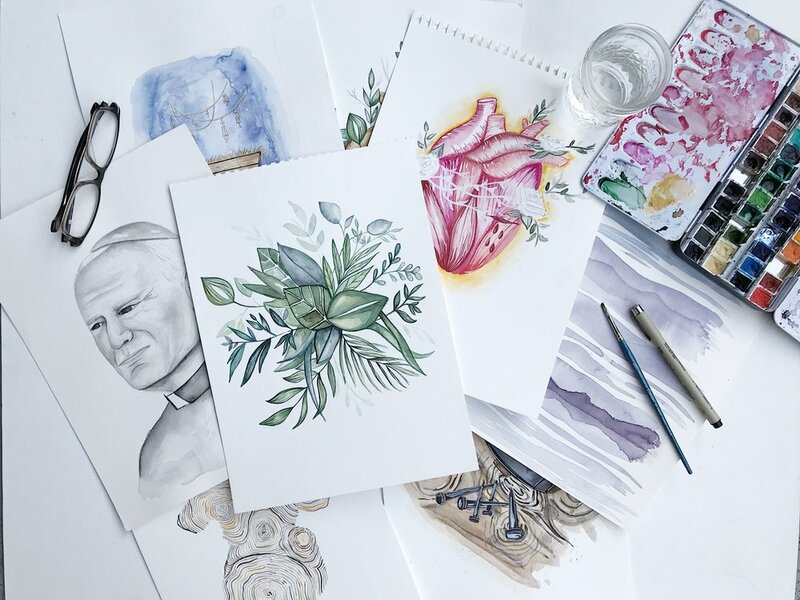 We included this feature to encourage people to spend some time preparing for each liturgical season and enter into the season with intention and purpose. As you finish out your journal you now have an incredibly opportunity to reflect back on a year of recording your thoughts! What a gift! This provides a tremendous opportunity for personal spiritual growth. Are there any recurring themes that stand out to you? Were you in a particular season where you saw God working in your life? Did you notice where the Lord was answering your prayers in unexpected ways? If you travel a lot, try recording the name of the parish, location, and priest of whatever church you are at. At the end of the year you can look back and see how many different places you visited! Try getting in the habit of taking 7 deep breaths before you begin reading and journaling. Consider reading over your previous journal pages every 2-3 months and look for common patterns and themes. Maybe you can pray on these ideas further or discuss them with a spiritual director. Try re-copying your “Scripture Speaks” quotes in the extra notes pages and see what the Lord has been saying to you through these verses. Could you create community around ESS? Maybe try creating a small community group and get together each week to discuss the readings and homily together. Also… what type of pen should I use? We’re so glad you asked! Our journals contain a thick, high quality paper which means it will accept almost any type of pen with minimal bleed through and smearing! Some of our favorite brands include Micron, Le Pen, and Paper Mate. Also, if you’re so inclined, you can watercolor on the pages provided you do not apply too heavy of a wash. We recommend this Winsor & Newton Pocket Set if you’re looking to invest in a quality but affordable set of watercolors (Christie says to never buy cheap art supplies!). Growing up, my pastor always called Mass the “most important hour of the week” and it’s something I think about frequently. This is the hour where we reorient ourselves to what is true. This world is loud, it clamors for attention, and we’re constantly being told what we should think. It makes it all the more imperative for us to truly take advantage of the gift of our Sacred Scripture, Holy Eucharist, and faithful community. Time with God is never wasted time. By taking accountability for our spiritual formation it allows us to become the disciples that God calls us to be. We cannot rely on our priests and religious life to do it all. Brothers and sisters, we must be willing to live our faith unabashedly which means we start with our own spiritual formation first and foremost. This is the underlying mission of Every Sacred Sunday and we pray that it helps you in this process. 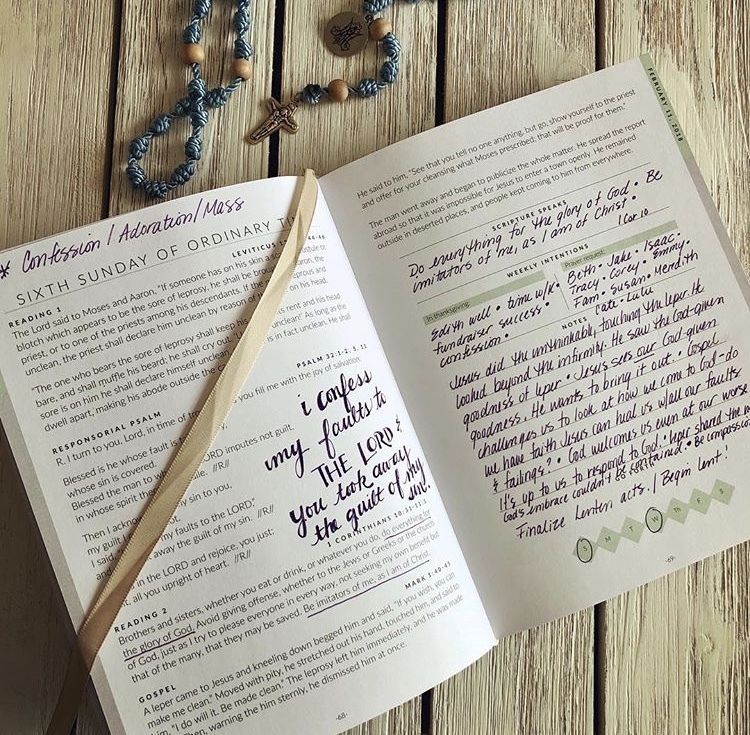 We have so many wonderful members of our #ESSfam on social media who regularly post about their journals and how they use it to meditate and deepen their relationship with Christ. Click on each picture below to see more!